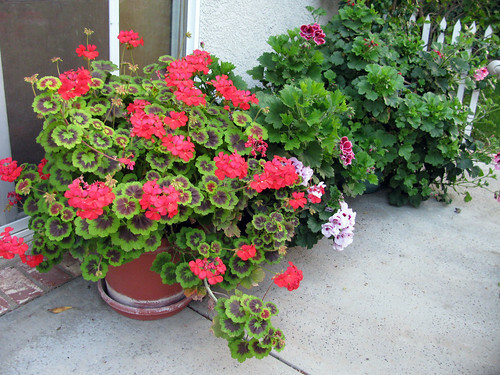 I let my containers of geraniums get a little overgrown. I kept meaning to trim them. I even wanted to transplant the really big Martha Washington into a bigger planter of some sort. I just haven’t found one I really like. Well, I waited too long. I went to water the plants today and a quail flew out from the pot in the back on the right side of this photo. I looked in and didn’t see anything at first so I moved some leaves. There were 11 spotted eggs shiny with water. 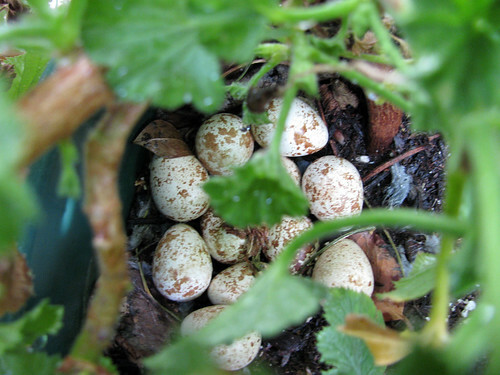 I don’t want a family of quails in my pot of geraniums. I don’t know how to water around the eggs. We will have to see if the chicks hatch. The mother quail really squawked and carried on while I examined the pots. It never occurred to me that birds would make a nest in a flower pot. Especially one I hose down every other day. This entry was posted on Wednesday, April 29th, 2009 at 3:00 am and is filed under Garden. Tagged: Garden. You can feed this entry. You can leave a response, or trackback from your own site.